Collaboration is a challenge for everyone. It’s difficult to focus on an issue and move forward with others in unison to find a solution or identify ideas. Successful collaboration requires a trusted environment, faith in those you’re working with, and a sense of security. While Remarq has many obvious attributes — it meets and exceeds open annotation standards, supports roles and functions scholarly publishers expect for authors, editors, and users, and features moderation, groups, updates, and live feeds, as well as an elegant, intuitive interface — what also sets Remarq apart is a secure, well-developed collaborative environment designed to instill user confidence. Users identified with their true names. Remarq validates the identities of participants and allows users to create rich profiles from validated sources like ORCID, add career highlights, link to their publications, and so forth. This ensures people know who they are working with and instills confidence in conversations and connections. Remarq keeps content and users safe from outside entities. Remarq protects user information by working as a secure, unified layer that stops outside entities from entering via bots or other software techniques. 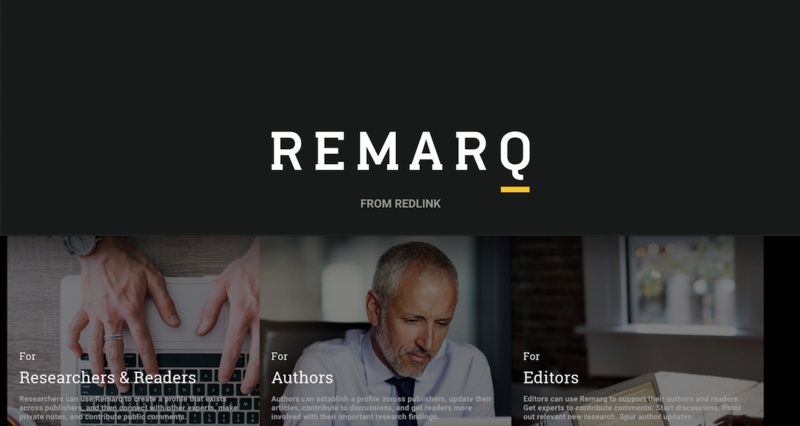 With a focus on the user, the publisher, and the collaboration among editors, authors, and users, Remarq supports collaboration without the threat of bots or malicious software. Only humans, please. Remarq blocks bots and validates identities to keep collaboration safe and secure. Publishers, authors, editors, and users can work together confidently, knowing that bots and other bad actors are prevented from threatening the security of the collaboration space. Consistency fosters confidence. Remarq’s consistent interface and user-friendly design engenders confidence by offering a uniform experience across journals, publishers, and platforms. This allows users, editors, authors, and publishers to keep their ideas and interactions front and center, without the distraction of variations in design. By eliminating distractions, fostering connection, and supporting collaboration, Remarq avoids the pitfalls that can derail progress. To find out more, visit us at Remarqable.com.